How it looks from the front. Pretty basic. It is not easy to correctly snap a good shot of the top of your head, I've found. I do this hairstyle at least once a week, and especially more often when the weather gets warmer since it gets my (tons) of hair off of my face and neck. It's also great for those of you who have bangs growing out and don't know what to do with the awkward in-between stages of growth. Tell me in the comments what you usually do with your hair on bad hair days. You know everyone has them, and I could use some fresher ideas for my hair too! Share, share, share! Aww the bun looks so cute. Definitely gotta try when it gets humid outside. 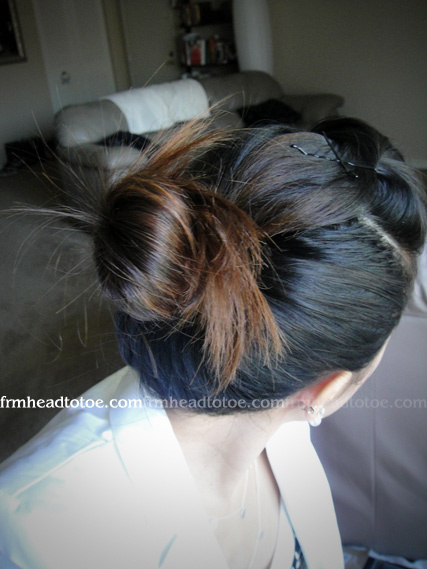 Whenever I have a bad hair day I usually wear a cute hat, pin my bangs back and tie my hair into a high pony hair, or just tie it up in a bun with some pieces hanging down. I curl them so they look less messy and more elegant. Love the blazer! Where is it from? love your hair! I miss having long hair so much. Can't wait for mine to grow out so I can try this. Your ombre dye job still looks great. Do a post on that plzzz ^_^!! love it!! so simple and elegant! 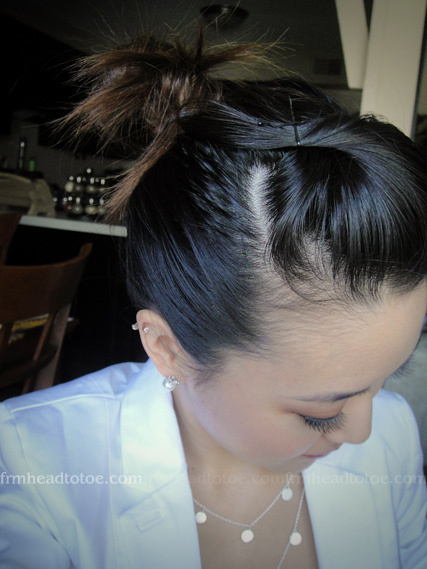 Aww I wish my hair was long enough to put it up in a Bun - you look so cute! i can't wait to try this hairstyle! karen: I'm not 100% sure I remember, but I think it was MAC 3D gloss in Racy. It was a limited edition gloss I picked up at CCO so I'm not sure where to find it now but I LOVE it! Definitely recommend it if you come across it. what nail polish color is that?? is so pretty!!! Banessaliu: It's from Stella & Dot. I wil be doing a vid + giveaway soon! You are a doll! I think you can pretty much pull off any look that you want to! I do something similar when I don't feel like fixing my hair, but I have to leave my bangs down b/c i feel that my forehead kinda looks big when I put my hair up. Your blog is becoming one of my favorites to read!